Your chickens will go wild for this Mealworm & Sunflower Treat Square! They will be clucking and jumping over each other before you can even get your treat out of the package. 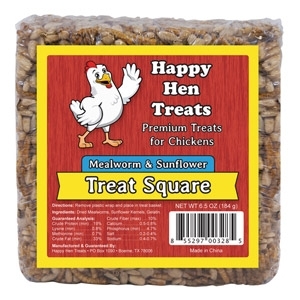 This 6.5-oz treat square is all natural - we keep our treats simple by only using ingredients like mealworms and sunflower kernels that chickens enjoy, ensuring that they eat every delicious morsel.